After navigating the humorously unwieldy customs experience at Ezeiza, the rest of the logistics unfolded quite smoothly, as karma would dictate. I wandered around the crush of people outside the customs gate til I found the short dude in a suit holding a sign with my name (not as easy as it might sound, since all these guys stand together in a big mob and you have to walk past them all, sloooowly, looking for the dude with your name as they all hopefully look back (because how crappy would it be if your job were to stand there in a suit waiting for the one person of thousands whose name you happened to be holding?). But found the guy, got in the cab, chatted up a storm en espanol with the driver, found my apt here in the Recoleta, and there I was in the antipodean spot I'd be calling home for the next month and a half. International travel is miraculous. Has that already been said? If so, whoever said it was totally right and a genius. So where is this place that I am? Some facts: it is the Recoleta, a barrio of Buenos Aires (and, NB, when I use this term it does not have the negative connotations that "barrio" sometimes does in the US, but simply means "neighborhood") that takes its name from the monastery and cemetery, each called "Recoleta" that have been here for some centuries. 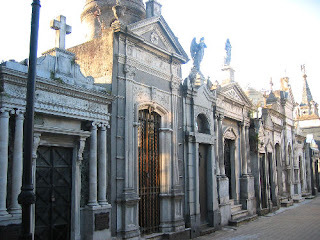 Evita Peron is interred in this cemetery, and it's located a half-block from my apt bldg. I can see the above-ground tombs quite clearly off to the left of my balcony. The Recoleta, I've been told and can sort of perceive, is on the upscale side, and has no shortage of nightlife. The latter became clear to me last night as I slept (or attempted to sleep) to the oonta-oonta beat of various nightclubs in the area. As the cabbie was dropping me off, he kept pointing out bars and clubs, which is great because now that I know where they are I can easily make sure to stay as far away from them as possible. 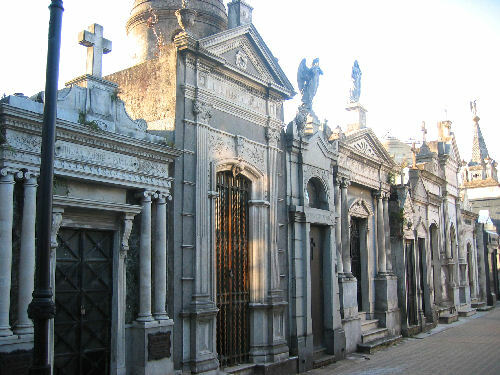 The Recoleta's noisiness doesn't bother me that much, really--it's akin to staying in New York City, where part of the package you have to expect is a constant din of citified noise. Plus, I'm on the sixth floor, so it's not terribly deafening. That said, the rhythm of life in BA is much, much later than I'm used to and generally prefer. A colleague invited me to dinner with her friends last night, and explained that they'd be meeting at 9.30pm, with dinner scheduled for sometime after 10pm--Monday night. This was more than my poor jet-lagged bod could handle, so I convinced her to meet up with me earlier, and we went to dinner around 8pm at a totally deserted restaurant, where the waiter looked at me as though I were insane when I ordered a meal (apparently 8pm is the Argentine equivalent of the Denny's old-person early-bird special hour). Earlier in the day, in my attempts to stave off jet lag, I'd done a few walk-arounds here in the Recoleta to acclimate myself with the environs. I'm emphatically not a tourist this summer; I'm a temporary resident with an apartment and a job, etc., much more like a longer-term Let's Go stint (e.g., Melbourne '98, Amsterdam '01) than being an itinerant traveler (e.g., Central Europe '05). Hence my first move was to find a store and get food, which was, if I may, a huge success, at least given my justifiably low standards for success. To wit, I looked at a map of the area, found something that seemed to approximate a store, and wandered in that direction. On the way, I stopped in at a cafe, asked for an ordered an espresso to go with no real difficulty, and then, heartened by my language success, asked the cafe dude where a supermarket was, and basically understood his explanation of the whole direction business, and the fact that the place was called the "supermercado chino" thanks to its having Chinese proprietors. I followed the directions, found the place, and boom--Chinese proprietors indeed. I wanted to hug them when I realized I had correctly understood the cafe guy's dialogue, but resisted because that would have been unbelievably weird and awkward. A final note, embedded in the above exchange: Everyone here seems to assume that I'm a fully fluent Spanish-speaking Argentine. This started when I got on the plane, and the flight attendants spoke to me in Spanish. Part of it is that Argentina, and Buenos Aires in particular, is so Euro-influenced that the folks don't look that different than what you might find in a Latin European country, hence DF is pretty much par for the course. But it's also that for some reason I've shed an obvious-American vibe, the same one that caused people in Deutschweitz for the past few summers to immediately clock me as the presumptive US-ian. And while no one is more intensely into being American than DF, I like that I can opt to blend in, at least until I begin chanting "U S A" in public at random times for no apparent reason.